No sooner do they meet than young Enza Ravanelli and Ciro Lazzari are separated across what seems to be an insurmountable distance. It is 1912, and 17-year-old Ciro has been banished from his home in the Italian Alps, not for something he has done, writes Adriana Trigiani, but for something he has seen. 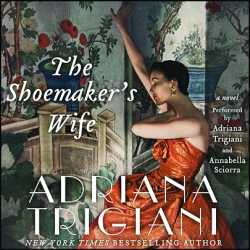 The Shoemaker's Wife, Trigiani's fourteenth book, finds an epic romance in hard work, loyalty and sacrifice. These are the bonds that bring Trigiani's Ciro and Enza together, and keep them close as they build new lives in America. Enza's talents as a seamstress earn her a place in the wardrobe department of the Metropolitan Opera, while Ciro's entrepreneurialism and skills as a shoemaker elevate him from servitude in a humble Italian convent to eventual prosperity in the America. The Shoemaker's Wife is filled with the scents and flavours of both Italy and America. Hot pretzels from a street vendor in New York City or a shared slice of pie from the vending machine at the Automat contrast with "the scent of fresh vanilla and sweet butter" that fill the convent where Ciro and his brother Eduardo were given a home after their father dies and their mother can no longer care for them. It's in tangible descriptions like these that Enza's longing for the Alps is understood. To return to the mountains of her childhood is not possible for Enza, but her memories and longing give the story its depth and beauty. I think I will definitely enjoy this book! Just need to wait for my library to acquire a copy now.